Louie goes out for the night. I was vaguely aware of Louie CK as a comedian but beyond listening to one of his shows on CD and seeing him on The Daily Show, I didn't know much. So I came to this show unsure of what to expect and by the end of the first season I was still not sure what to expect minute to minute because it is a very unusual show. This is a 25 minute comedy that takes snippets of him doing stand-up as the base but has one, maybe two "sketches" which act as the body of the show, some of them are funny, some of them are not, but they are engaging. It is very unsettling though because you will be watching a "bit" about God being a bit of a jerk in the Old Testament but then the "sketch" will be a childhood experience where a Doctor (wonderfully played by typically odd Noonan) gives a graphic and long account of the physical horror of Christ's crucifixion. Another example is an episode that consists of Louie's very unfunny humiliation at the hands of a bully and then a discussion with the boy's father on the subject. 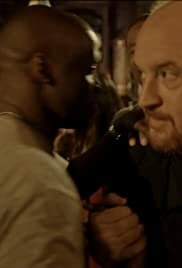 It is a constantly unsettling connection between dark material that is engaging but not funny, and some material (stand-up and otherwise) that draws big and easy laughs on some very dark subjects (Louie proposing how to reduce child murder is a logic but very uncomfortably funny one). I have no idea how he writes this stuff and makes it as good as it is because I can barely describe it, far less create and structure it. The idea seems to stem from the comedian's lot not being a happy one and that the funniest guys are able to draw on a lot of oddity, darkness and misfortune to make their acts work. This is certainly what is said in one scene where Louie brutally deals with one heckler and then describes why it is a big deal to her. So while this show gives you some shockingly offensive material that actually makes honest sense, it also provides these near-dramatic interludes that don't make you laugh once but yet have an oddly comic darkness to them that I found really engaging and uneasy at the same time. There is much here that could easily just not work but yet it does work in a very brutally dark and honest way. This show will not be to all tastes and I can understand why some viewers love the comedy but hate the "unfunny" sketches, but I found it all compelling and really well put together. Awkward, painful, brutal, hilarious and really well made, this is a show that is as great as it is hard to classify or explain – I hope season 2 can maintain the high standard set here.